Listen: C. Eric Banister on Pop Culture Tonight with Patrick Phillips! C. Eric Banister, author of Johnny Cash FAQ, talks with Patrick Phillips of “Pop Culture Tonight” about Johnny Cash’s musical legacy and Banister’s book. Johnny Cash remains one of the most recognizable artists in the world. Starting in 1956, he released an album every year until his death in 2003. In addition to these albums, there were also some posthumous releases in the years after his death. From rockabilly to country, folk to comedy, gospel to classical, the prolific Cash touched them all. His hit singles crossed over from country to pop, as he transcended genres and became a superstar around the globe. Cash skyrocketed from the beginning, flying through the ’60s until he was one of the country’s biggest stars by the end of the decade. Following his own muse through the ’70s, Cash slowly faded commercially until he nearly disappeared in the ’80s. Instead of giving up, he made an incredible late-career run in the ’90s that took him into the new millennium, along the way collaborating with various contemporary rock and pop artists. His offstage problems often overshadowed the music, and his addiction often takes center stage in the story, pushing the music off the page. 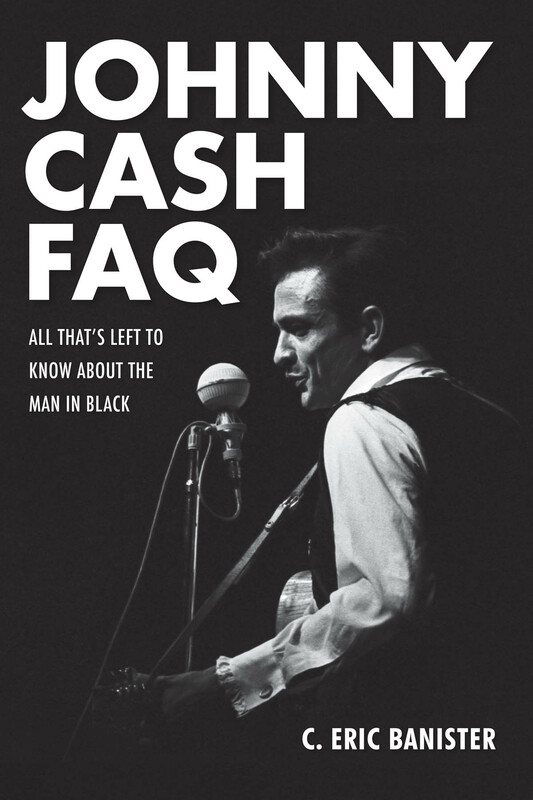 But Johnny Cash FAQ celebrates the musical genius of Cash and takes a look at every album Cash released, the stories behind the hits, and how he sustained a fantastic nearly 50-year career. On this date in 2003, the legend that was Johnny Cash sadly passed away. Johnny Cash FAQ author C. Eric Banister reflects on the legacy of the Man in Black and how, even after his death, his artistry continues to have a powerful impact upon his fans. It seems odd to say someone died in their prime at age seventy-one, but it’s true of Johnny Cash. It might be more accurate to say it was one of his primes, since Cash had a habit of fading away and then making a comeback of sorts. When he passed away on September 12, 2003 his newest album, the fourth in the American Recordings series, was not a year old yet and was on its way to a #2 peak on Billboard’s Top Country Albums chart (and #22 on the Billboard 200). Just after his passing the boxed set Unearthed was released, and along with the two remaining American Recordings albums released in 2006 and 2010, showed that he was still in a creative upswing even though his health was in a down period. The sales numbers of these final projects showed that Cash still had legions of fans and the world would miss him immensely. Even now, eleven years after his death, Cash still claims large numbers of fans. In March of this year a “new” Cash project was released in the form of Out Among the Stars. Based on recordings made in 1981 (and 1984) with legendary producer Billy Sherrill and later shelved, the album wasn’t what fans of American Recordings had grown used to, but the fans took it to #1 on the Billboard Top Country Albums chart and #3 on the Billboard 200. Cash’s legacy remains a driving creative force, as evidenced by the recent release of Look Again to the Wind: Johnny Cash’s Bitter Tears Revisited. Fifty years ago, Cash released the masterpiece Bitter Tears: Ballads of the American Indian. It was a bold move for a country musician and one that saw him shift a bit in the eyes of many to a more folk-centered singer. It didn’t matter how others saw him, Cash was doing it because he cared about the cause and he liked the songs, many of them from the pen of Peter LaFarge. At a time when many were picking up the banner for civil rights, Cash did so as well. Except where many picked up on the struggles of the African-American in the South (and rightfully so), Cash was drawn to the “Red Power” movement. Even with the shift in tone for Cash, the album still topped the Country Albums chart and broke the Top 50 of the Pop chart. Its lone single, “The Ballad of Ira Hayes,” peaked at #3 on the Country Singles chart, but it was a battle with disc jockey’s to accomplish that. (Cash famously put an ad in Billboard calling them and other industry folks out for cowardice). Throughout his life Cash was often compared to Hank Williams, both in terms of artistry and in self-destructive behavior. Like Williams, Cash’s creative art will continue to inspire musicians even another fifty years from now. Eleven years gone, and never forgotten.